24-hour forecast: Mostly sunny today with isolated showers. Cloudy at times tonight with a few showers and the chance of isolated thunderstorms mainly over the south and coast. General Outlook: A few showers and isolated thunderstorms will continue to affect southern and coastal areas Sunday morning spreading to most areas Sunday afternoon and Sunday night. Today NE 5-15 kts Light Chop 2-4 ft ISOLATED SHOWERS. Tonight NE 5-15 kts Light Chop 2-4 ft A FEW SHOWERS AND THE CHANCE OF ISOLATED THUNDERSTORMS. Tomorrow NE 5-15 kts Light Chop-Choppy 2-4 ft A FEW SHOWERS AND ISOLATED THUNDERSTORMS. Tradewinds are noted throughout the Caribbean sea with scattered showers over the Leeward islands and over W Cuba. Broad high pressure across the west-central Atlantic will maintain fresh to strong winds across much of the central Caribbean through Tue, with highest winds near coast of Colombia at night. 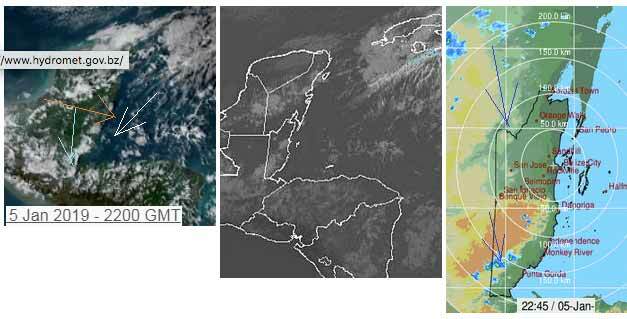 A cold front will stall and weaken in the NW Caribbean on Sat. On Ambergris Caye this morning we have a flat calm sea with no wind after a hard early morning rain. Today's expected high temperature is in the upper 80's. Typically, there is cloud streaming out of the Pacific, in a line over north Mexico and southern USA, this has been coming further south over the last few days, but now it is breaking up. Cold air from the north can do this sometimes, but presently there is cloud coming down from the north and a new high level is forming from the west. 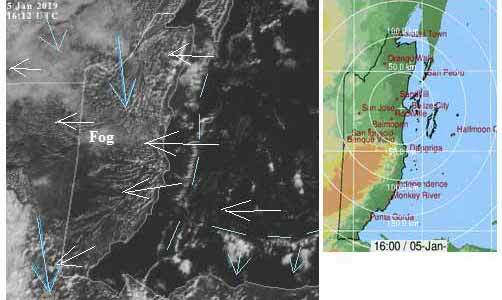 At the same time, the Caribbean winds, often with stringley lines of cloud, come in from the east. Right now all three of these air movements are effecting Belize, plus fog in much of central Belize. So the north of Belize is being effected more by the air and patches of thinnish cloud from the north, southern Belize is getting the easterly Caribbean air, which is now starting to form lines of cloud over the low lands. Presently no rain, but I had significant rain last night or early this morning. 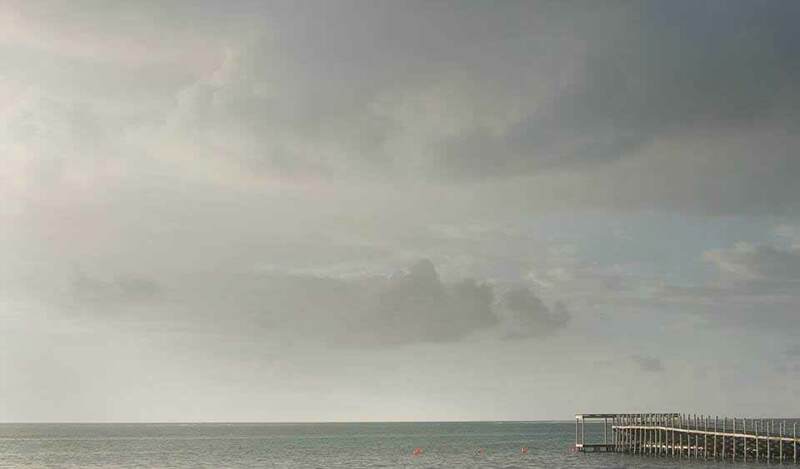 Fog is normally cloud on the ground, there are several causes, most of the fog in southern Mexico and Belize is 'Radiation' fog, caused by clear sky, dropping surface temperatures causing the air to condense moisture. But what happens to that fog. ? Well as the day warms from the sun, that fog rises, so now now fog on the ground, but it looks like low flying cloud, but it is not the normal clouds and it will thin and evaporate away as the morning warms up. This is quite common this time of the year in parts of Belize. Looks like today will be rather variable, even after the fog has cleared. Sunshine in the north is being replaced by an increasingly thick cloud from the north. 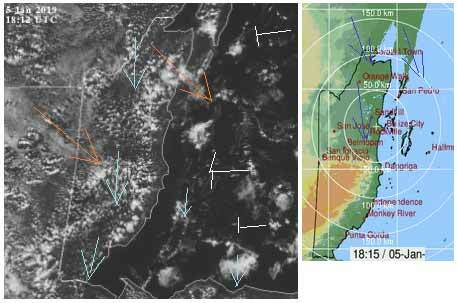 Sunshine in the south is being replaced by lines of Caribbean easterly clouds and sunshine. Central Belize will be a mixture of both these two clouds. Presently no rain, but there could be the odd patchy rain later. The Cloud picture has now significantly changed. Virtually all the air movement over Belize is now from the north. The easterly Caribbean wind has now been stopped in its tracks, out at sea. 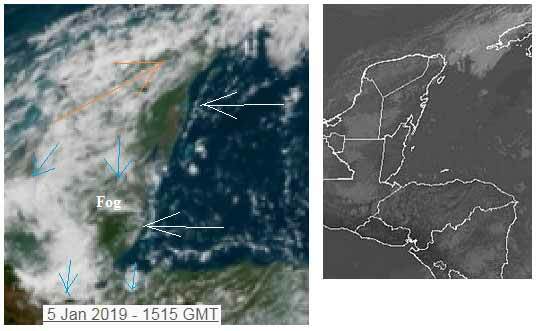 There is now some NW high level cloud, but very thin and not really causing any weather for us, but the clash between the cool air from the north and the Caribbean air is causing some rain showers down inside the coast line, and more up in the Yucatan. Today, weather wise, has been rather complex, although you may not have noticed all that has been going on. The cool air is now causing the Caribbean air to come from the NE. Cool air continues from the north, and there is high level from the NW Between them, they are now causing rain areas in the Yucatan and Toledo. 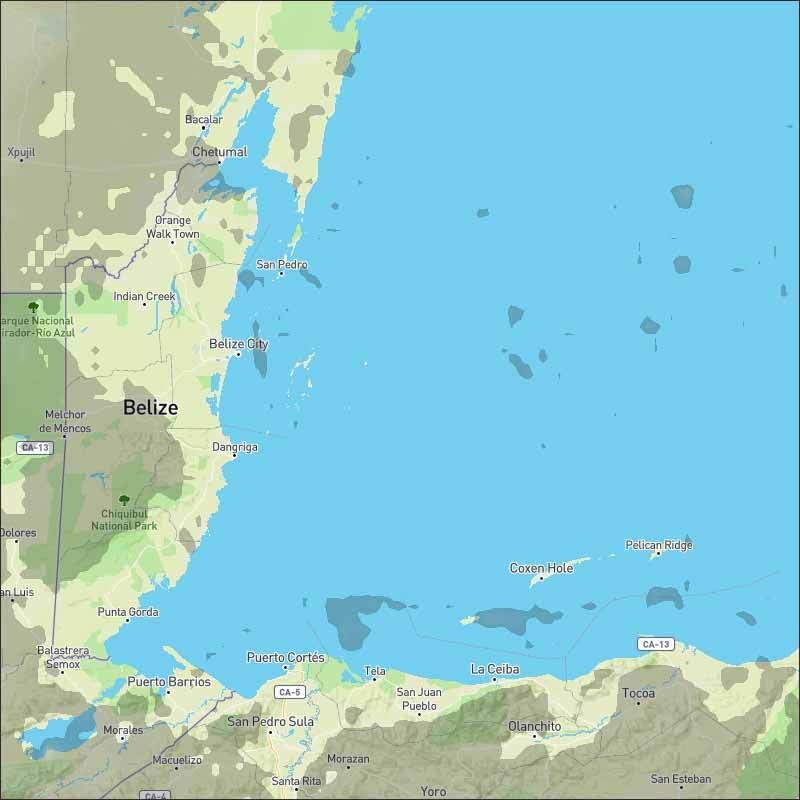 Quite probably isolated rain over night in various parts of Belize. Looks as if Tomorrow SUN 06 Jan - Is going to be a complex and variable weather. Probably areas of fog, areas of cloud and a chance of some rain showers, then probably later, cloud and sunshine. And probably rather changeable during the day.